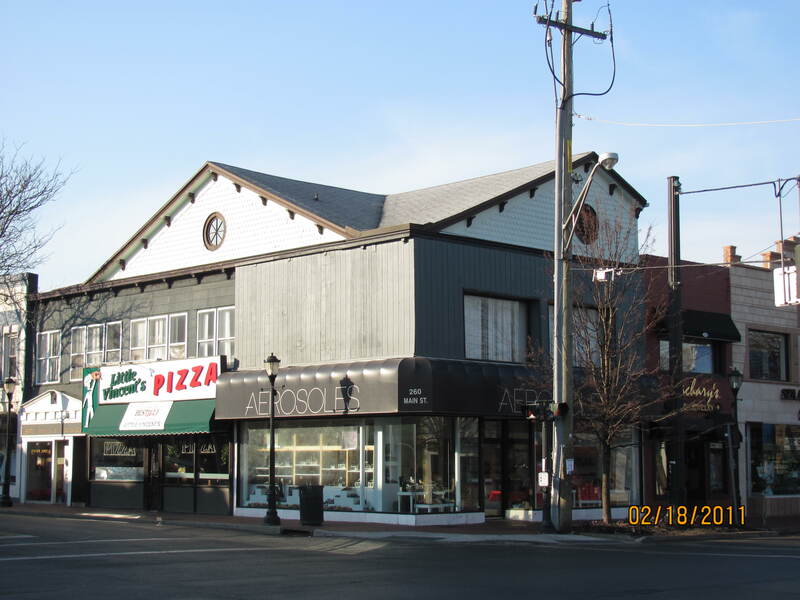 The building at the southwest corner of Main Street and New York Avenue in Huntington village has an unusual shape. It’s as if someone chopped off the western third of the building. And, in fact, that is what happened. The first building at that location was erected by Stephen C. Rogers in 1860. Rogers and David C. Brush had opened the Suffolk Hotel just to the west of the corner lot in 1840. In the summer of 1860, Rogers built what was initially called a “Village Hall.” It was not built for governmental purposes, rather as a venue for lectures, concerts and meetings. It was estimated that the 27’ x 56’ building would seat 600 persons, which seems an overly optimistic number. In September 1860, the new hall opened with an address by the Reverend Hiram Crozier on the science of music, which was appropriate because the new venue was known as Euterpean Hall, named for the Greek muse of music. The address, of course, was followed by a concert. Euterpean Hall was used not only for concerts, but also for lectures, religious services and town meetings. Both the Central Presbyterian Church and the Methodist Church used the hall for religious services when their church buildings were being constructed. The Hall was used as a drill room when men were training to defend the village from a supposed Draft Riot at the West Neck brickyards (see The Irish in Huntington, posted on this site on March 17, 2012). The ground floor of the building housed the grocery business of Stephen Morris and the feed store of Russell Hurd. The grocery business was later assumed by Sammis & Baylis and the feed store became the meat market of Burling & Higbie. Rogers retired from the hotel business in May 1864, but continued to own the land until 1875 when he sold it to Samuel Hubbs. In 1899, the executors of Hubbs’ estate sold the property, which included the Euterpean Hall building, to Edward Carll, the son of Northport’s famous shipbuilder Jesse Carll. At the time of the sale, it was announced that the Euterpean Hall building would be taken down and replaced with a wider two-story building that would cover the alley between Euterpean Hall and the hotel and contain three stores. Within just a couple of weeks, the two businesses in the Euterpean Hall building were relocated to a new building on New York Avenue and the old building was torn down. A month later the new building was completed and Sammis & Baylis as well as Burling & Higbie moved back to Main Street. The second floor was used as sleeping accommodations for the Suffolk Hotel. After the hotel was torn down in 1927, the second floor rooms were converted to office use. Edward Carll died in 1913 and left the Main Street property in trust for his family. The heirs sold the property in 1921. The following year, the portion of the building containing corner grocery business of Sammis & Baylis and the middle store occupied by the Barr & Willis jewelry store was purchased by Henry M. Woessner. 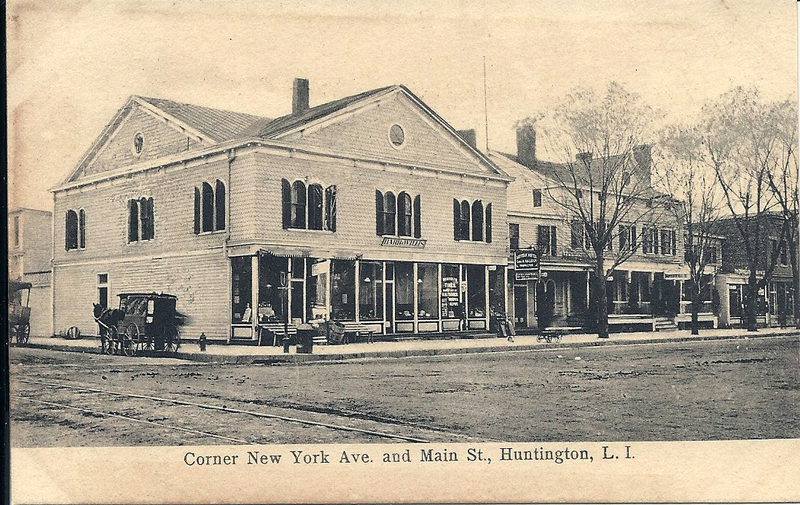 Woessner and his brother-in-law John F. Semon owned a pharmacy on Main Street opposite the Bank of Huntington. Woessner made several improvements to the store including installing large show windows and a soda fountain. The new store opened on July 29, 1923. Within two years, Woessner had transferred the pharmacy business to Harris A. Tomashoff. In the westernmost storefront, David W. Trainer conducted his stationery and newspaper business. In 1928, the drug store was re-divided and the middle storefront was used for a shoe store. In 1934, just as the drugstore (now the Max Rosen Pharmacy) and the shoe store were about to be taken over by Walgreen’s, fire swept through the building. Believed to have started from an oil burner in the drugstore, the early Saturday morning fire gutted the stores and second floor offices. Above the drugstore and shoe store were two dental offices. Above Trainer’s stationery store was the law office of Theron Sammis. Although it was one building, there were two owners. The two storefronts to the east were owned by H.T. and S.E. Corporation (H.T. was Harris Tomashoff and S.E. was Sol Elkins). The western most storefront and office above was owned by Trainer. It was thought the entire building would have to be razed. Tomashoff and Elkins decided to restore their portion of the building. Trainer decided to start over again with a new brick building. The result is Huntington’s lopsided building. A later account (The Long-Islander, March 25, 1899) indicates that Rogers raised the second floor of an existing building. Contemporaneous accounts confirming this assertion have not been located. The Long-Islander, September 28, 1860. It should be noted that there had previously been a Euterpian Hall in Huntington. In 1852, the Odd Fellows Hall was re-dedicated as Euterpean Hall (The Long-Islander, November 12, 1852). The location of this hall has not been determined yet. Euterpean Hall later relocated to a third building at the northeast corner of Main and Wall Streets. The Long-Islander, March 25, 1899. The Long-Islander, October 29, 1942. Semon later entered the real estate business and built Columbia Hall on New York Avenue in Huntington Station, the first three story office and business building in that section of town. The Long-Islander, April 20, 1934.